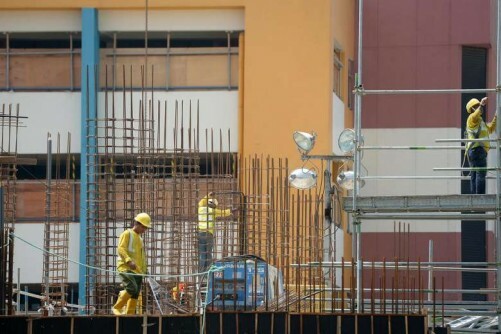 SINGAPORE - The director of a construction firm has been fined $21,000 for falsely declaring salaries to obtain work passes for 10 foreign workers. Tan Boon Sing, 51, was charged with 10 counts of the offence, made between October 2014 and May 2015, the Ministry of Manpower (MOM) said in a statement on Friday (July 8). He pleaded guilty and was fined $21,000 in default of nine weeks' imprisonment for three charges. The remaining seven charges were taken into consideration in the sentencing on Thursday. Both Tan and his company, KT Engineering & Construction Pte Ltd have been barred from hiring foreign workers. Tan had declared the salaries of the workers to be $2,200 so as to meet the salary requirement for an S Pass, even though he knew that they would be paid a lower amount. The workers were granted S Passes based on the false information provided, MOM said. Later, investigations revealed that the workers were each paid a monthly salary of $1,400. The company would issue a monthly $2,200 cheque to each worker. Tan then instructed a former employee, 44-year-old Indian national Peyarijohn Shekatham, to collect $800 in cash from each of the workers each month on his behalf. The workers were told that their work passes would be cancelled and they would be sent back to their home country if they did not comply. Tan has since returned the money collected to all the workers. Peyarijohn "will be dealt with in due course" for helping Tan to collect kickbacks, MOM said. "This is a serious offence and we will take strong enforcement action against such employers, including barring them from employing foreign workers," said Mr Kandhavel Periyasamy, director of employment inspectorate at MOM's foreign manpower management division. Offenders found guilty of false declaration offences can be jailed for up to two years, or fined a maximum of $20,000, or both. For kickback offences, offenders can be jailed for up to two years, or fined up to $30,000, or both. Members of the public who know of such cases can report the matter to MOM at 6438 5122 or e-mail mom_fmmd@mom.gov.sg. All information will be kept strictly confidential, MOM said.